What are the different types of wood available for wood fencing? Fences are for marking lines, defining your yard from your neighbors, the cow’s yard from yours, the yard from the road, so your dog doesn’t get hit. These are essential lines to draw, and the aesthetic of them is as important as their strength and functionality, and it will change up depending on what kind of line is necessary. One of the most common ways of defining the lines are fences, and a general favorite for the materials is wood. The classic white picket fences, the privacy fences, etc. all made of wood. 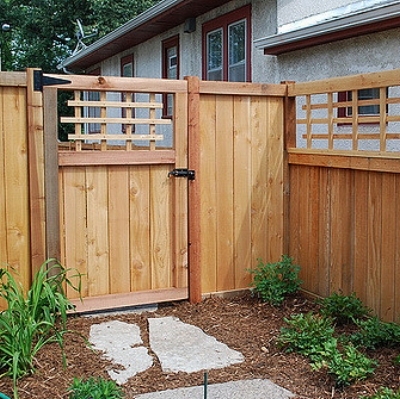 Pine is a perfect fence material; it’s durable, resistant to rot and bug infestations. It’s even better when it’s been treated, but in general, it’s highly affordable. These are a lower grade and are the prefabricated picket fence sets that are ready to install right away. Cedar is one of the most common woods used for fences. It’s naturally full of these oils that deter insects like ants, termites, and other swarming pests that will shorten the life of your fence and cost money. On top of that, it’s incredibly resistant to rot, and with the extra treatment, this is an excellent material for your wood fence. Like Cedar, Cypress is resistant to insect infestations and rot. The resistance in Cypress trees comes from a chemical called cypretime that naturally occurs in the wood. The downside to cypress is that it can be much more expensive than Cedar because Cypress will only grow in specific areas of the country. The shipping and maintenance raise the price quite a bit. Speaking of expensive, the most expensive on the list is the Redwood. Redwood is incredibly costly, so much that it’s not recommended for use for wide-scale projects. The initial cost is astronomical, and it’s very high maintenance. But, it’s also really durable, and if properly maintained it will last for a long time and is the most beautiful fence material listed. Don’t avoid using it, just make it worth it. There are seven grades when it comes to lumber, and only about four of them are good enough to withstand the elements well enough to be a suitable fence. Standard through Quality aren’t suitable for being fence wood. They won’t have any durability against the elements and will quickly fall apart and rot. Select and up are much more durable, but if you’re looking for longevity in your wood fencing, aim for the fences and get the clear grade. Your wood fence installation will last much longer.